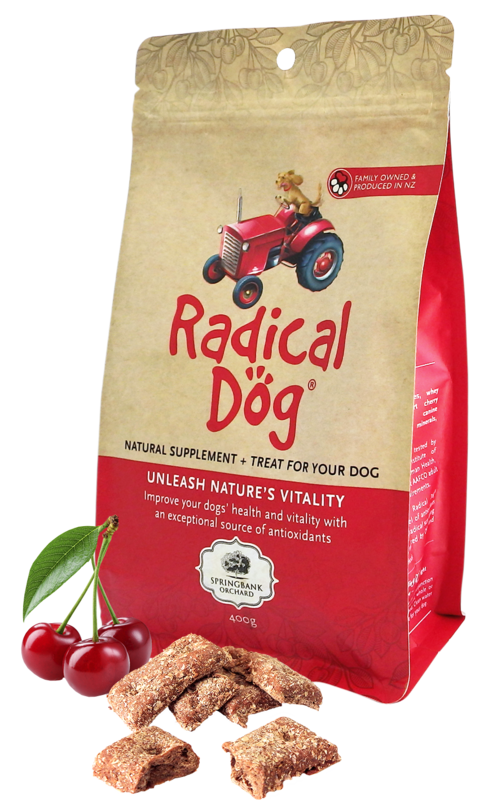 Radical Dog is an innovative treat, supplement or full feed for your dog... and we have something for every appetite! Watch our video to learn more about our journey. The all-natural 3-in-1 superfood for your dog. Radical Dog is a revolutionary new supplement for man's (and woman's) best friend. Handmade on our farm orchard, these bite-sized dog treats are filled with Montmorency tart cherries, an antioxidant-rich super-fruit that naturally fights harmful free radicals. The result? More energy, increased joint flexibility, a healthier coat...and one radically happy dog! Plus, you'll enjoy the peace of mind of our 100% Taste-Back Guarantee. the super fruit that delivers exceptional results.